During most of my pregnancy with Evan, my biggest craving was for Japanese food. I spent many weeks making numerous recipes from the two Japanese cookbooks I own and scouring various food blogs/foodgawker for more ideas. This sunomono recipe was the result of one of those searches. Unfortunately, the vinegar was a big trigger for my heartburn during the second and third trimesters. I am happy to finally enjoy this salad again. Sunomono is a Japanese vinegar salad with many possible variations. The basic components include vegetables (and sometimes seafood) marinated in a seasoned vinegar dressing. 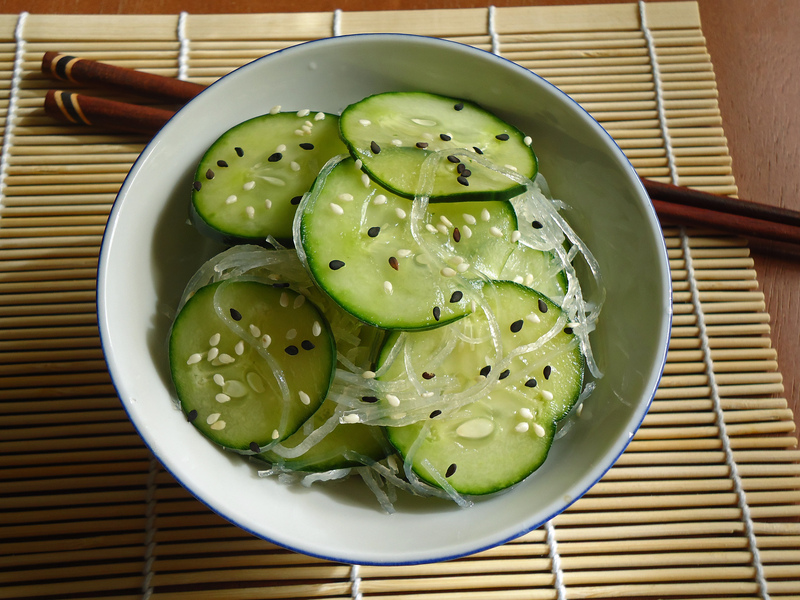 This particular recipe has cucumbers and cellophane noodles marinated in a vinegar, sugar, soy sauce. It is a light and refreshing accompaniment to a Japanese meal. I used the garden cucumbers from my CSA box. If you use garden cucumbers, make sure they are unwaxed or peel them. 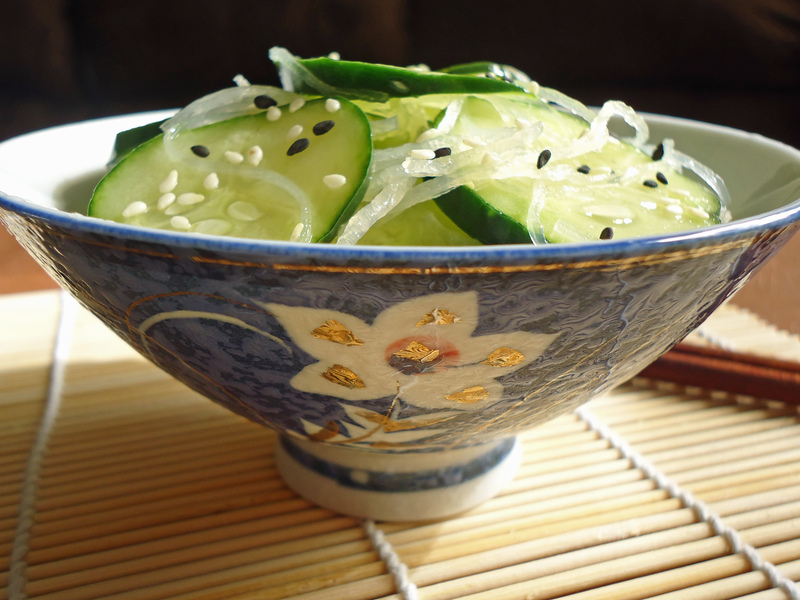 The best cucumbers for this recipe are Japanese, followed by English. Japanese cucumbers look like English, but the skin is bumpy. They are mild with minimal seeds. They are also crisp and less bitter than the garden cucumber. English cucumbers have less flavor, but they also have a thinner skin and less seeds. Make sure the rice vinegar used is unseasoned. Seasoned rice vinegar has sake, salt, and sugar added. It is often used in sushi rice. Place the cellophane noodles in a medium bowl filled with very hot water. Let sit until noodles are clear and tender. Drain, rinse, and drain again to remove as much moisture as possible. Cut the noodles a couple of times to make easier to handle and mix. In the drained medium bowl, whisk together rice vinegar, sugar, soy sauce, and salt until ingredients are completely dissolved. Mix in the noodles. Chill in refrigerator. 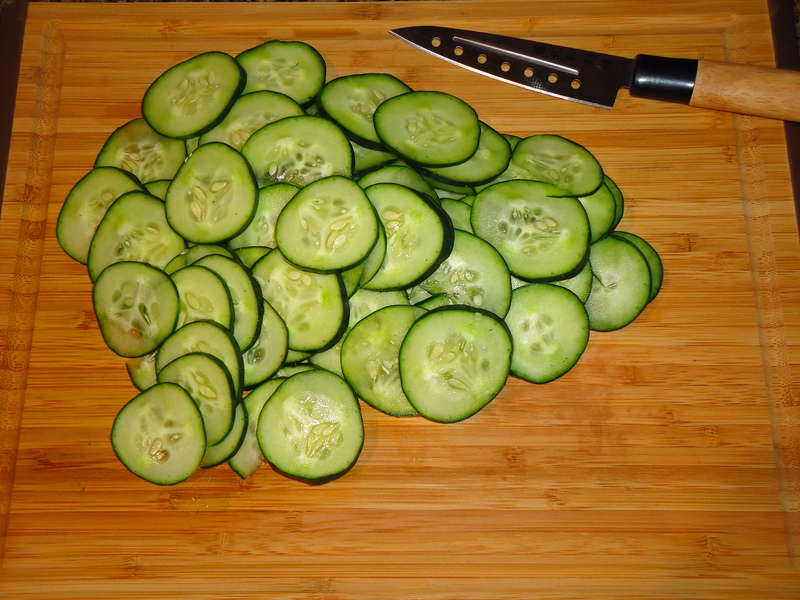 Clean the cucumbers well and cut crosswise into very thin slices. Lay out the slices in a colander and sprinkle with salt. Let sit for 15-30 minutes. Rinse and drain well. Mix the slices with the chilled noodle mixture and return to the refrigerator for at least 15 minutes. Garnish with desired toppings and serve cold.